To melt white vanilla chips or candy coating, place 1 cup or 6 oz. at a time in medium microwave-safe bowl. Microwave on MEDIUM for 3 to 4 minutes or until melted, stirring once halfway through cooking. Stir until smooth. Use a vegetable peeler to shave vanilla curls from the smooth underside of a white baking bar or vanilla candy coating square. 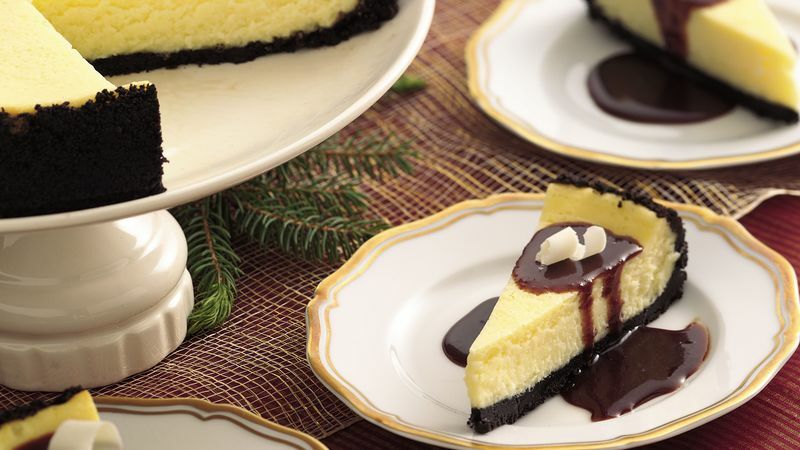 Spoon the chocolate sauce over each piece of cheesecake and garnish it with a white chocolate curl. Use a food processor to crush the wafer cookies, or seal them in a heavy-duty food storage plastic bag and press them with a rolling pin. Or use already crushed chocolate wafers boxed and available in the grocery store baking section. For neat slices of cheesecake, wipe your knife blade clean with a warm wet cloth between each cut. Prepare the recipe up to one day in advance; cover and refrigerate the cheesecake and sauce separately. Before serving the sauce, microwave it for 10 seconds and stir to restore it to its original consistency.